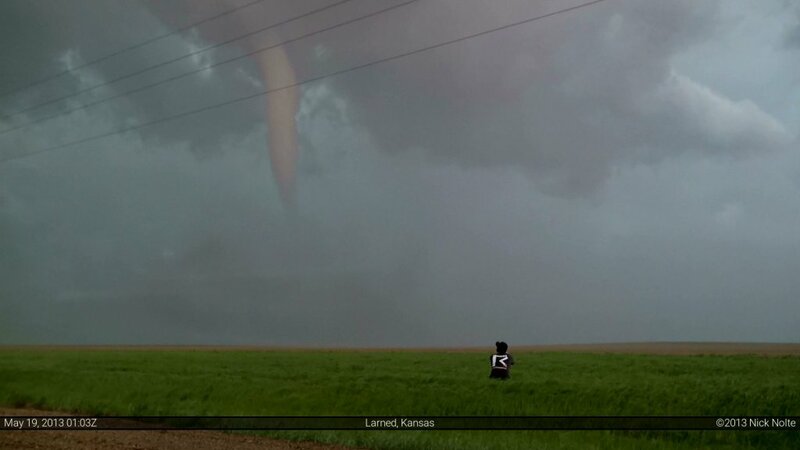 Today was the start of three heightened days of severe weather in The Plains. 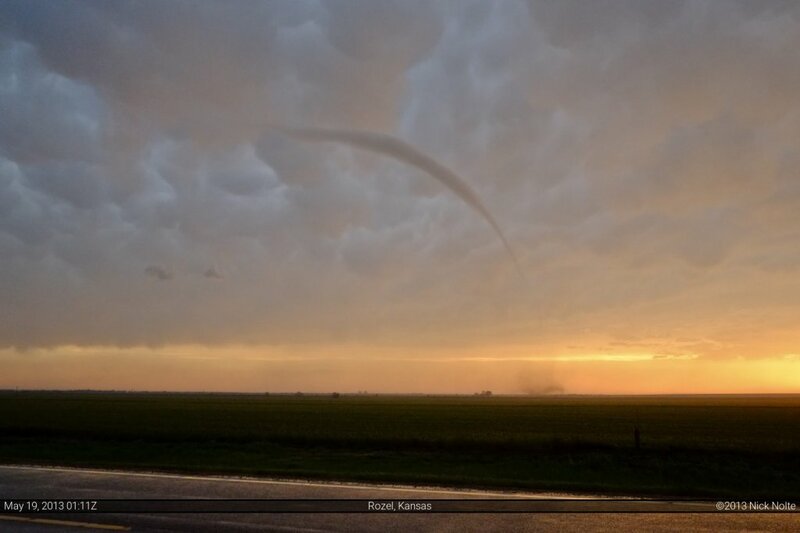 It looked like severe storms and tornadoes were likely all three days from Central Kansas into Central Oklahoma. We had spent the night in North Platte, NE and needed to get on the road early to get to our target of Dodge City, Kansas. We left North Platte shortly after 9am and hit the road south. SPC had issued a moderate risk for severe weather with 10% hatched tornado probabilities across our target area. That trough was pushing a bit further east into the plains and the next three days looked to be primed for severe weather. The dryline was expected to setup in western Kansas into Oklahoma and push into an area with 4,000+ J/Kg of CAPE. 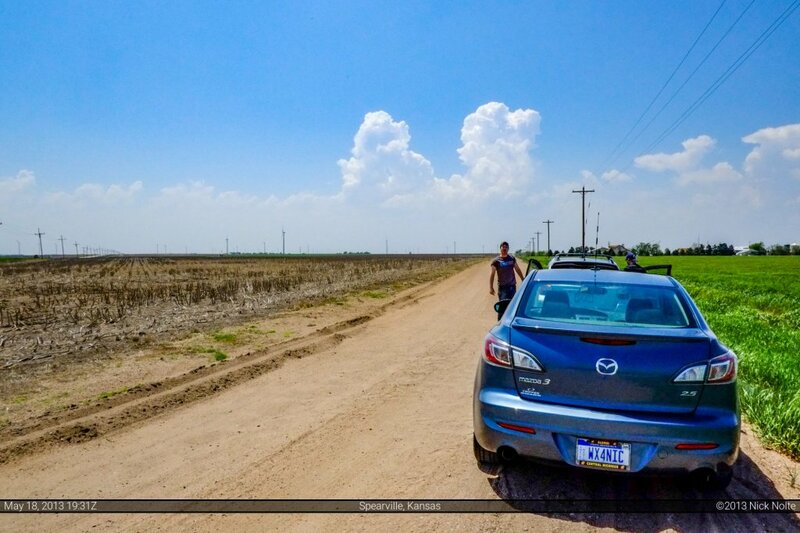 We arrived in Dodge City around 1:30 and drifted east outside of town to sit and wait for something to develop. 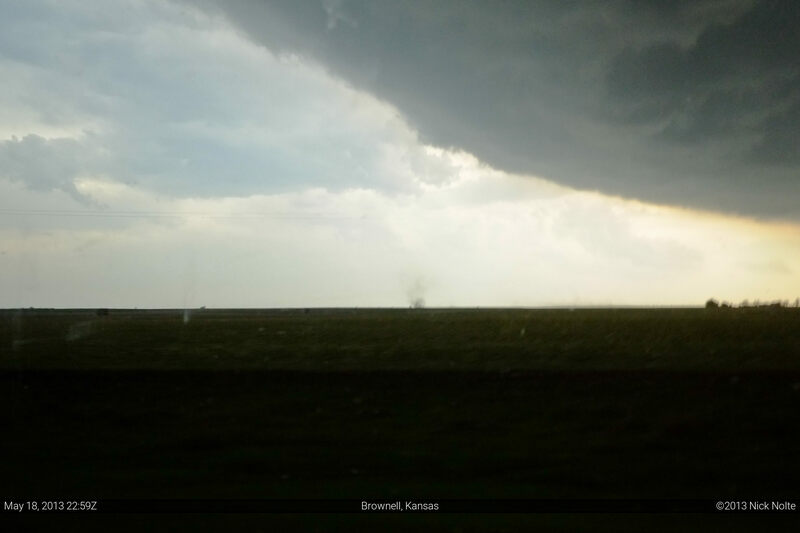 A Cu field started to develop across southwestern Kansas and we were in pretty good position to watch the towers develop before we picked one out to attack. 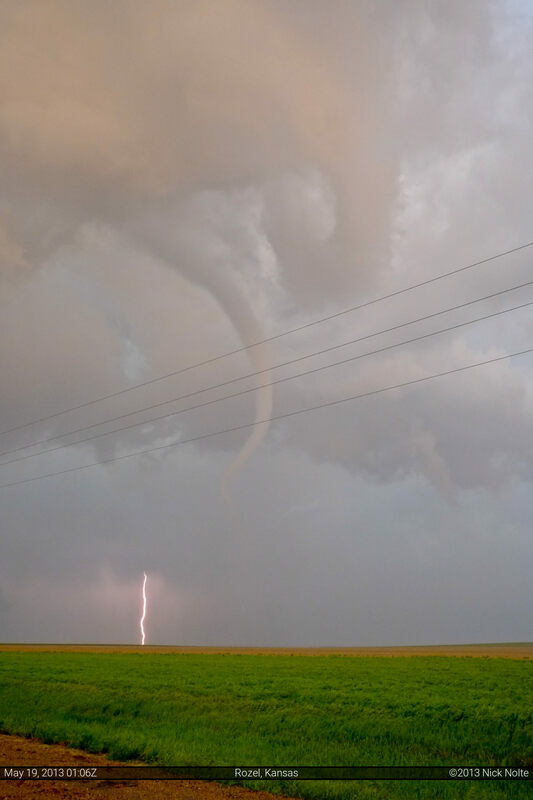 SPC issued the tornado watch shortly after the above photo and eventually storms exploded quickly. We had to decide when to go after one and one to the north looked pretty good so we headed up in that direction. 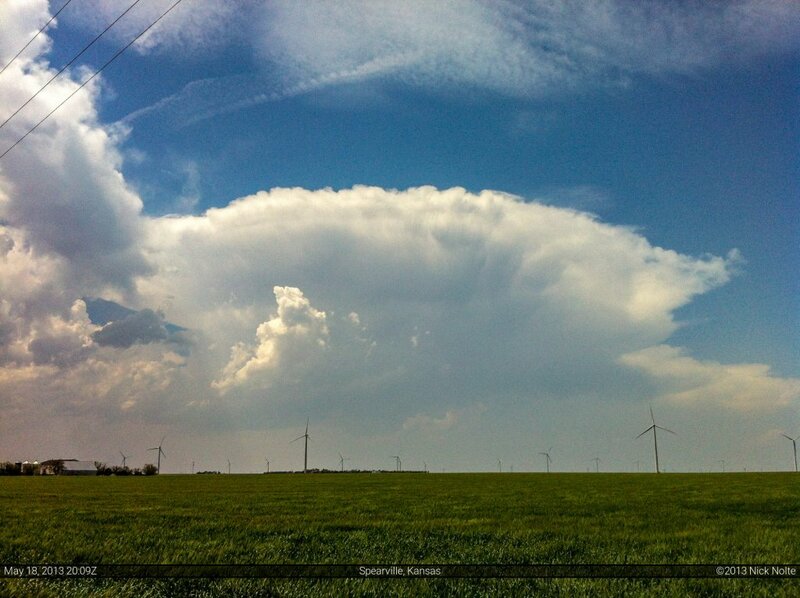 This little cell was going up near Jetmore so we headed up towards it. I got separated from the rest of the guys so I made my way west from La Crosse to close in on the cell and eventually got up on it east of Ransom and noted a wall cloud on it, but it was very ragged looking and didn’t last very long when after I got there. 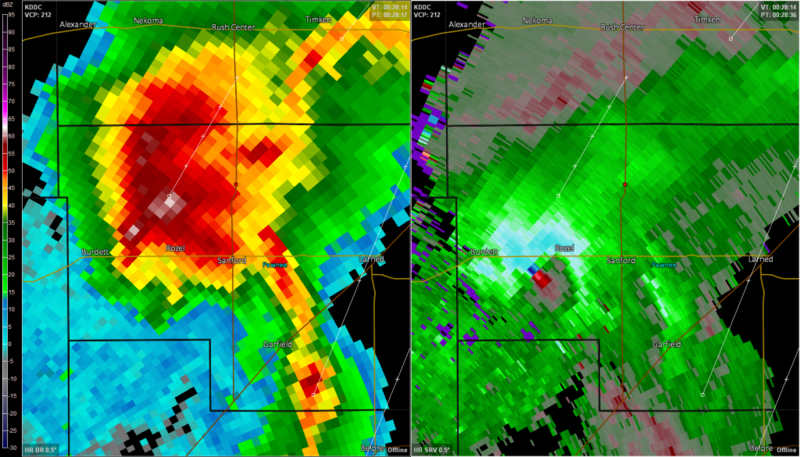 As I observed the storm I got a cool blast of outflow in my face and decided this one was probably done. It was becoming obvious at this point that the storm was probably done. Meanwhile, new development to our south piqued our interest and Jon pulled off the road in Schoenchen just before US 183 to come back and talk things over with me. He was looking at the new cells to the south, as was I and I said “if I was chasing alone, I’d already be on the way down there” He agreed and we started the journey south towards the new cells near Rozel. As we approached the storms on US 183 it became clear we would have to core punch to get to the other side. 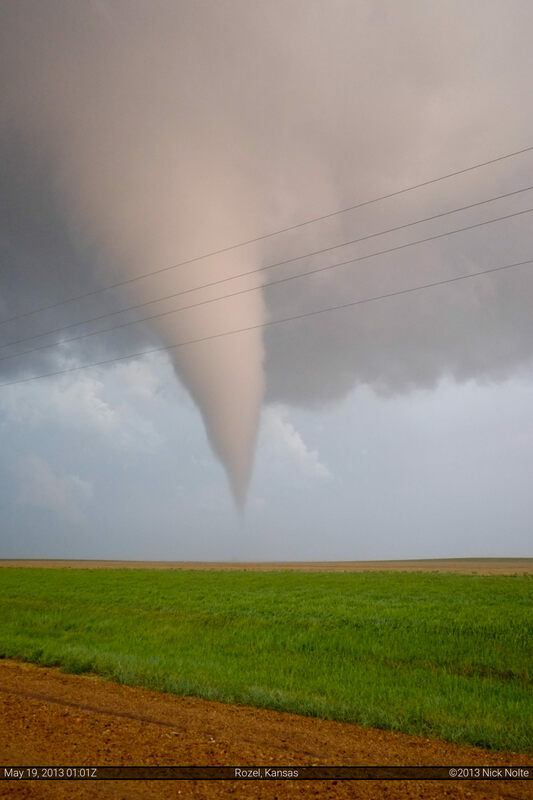 Just as that was going through out heads the tornado warning was issued and shortly after the Rozel EF-4 tornado began. 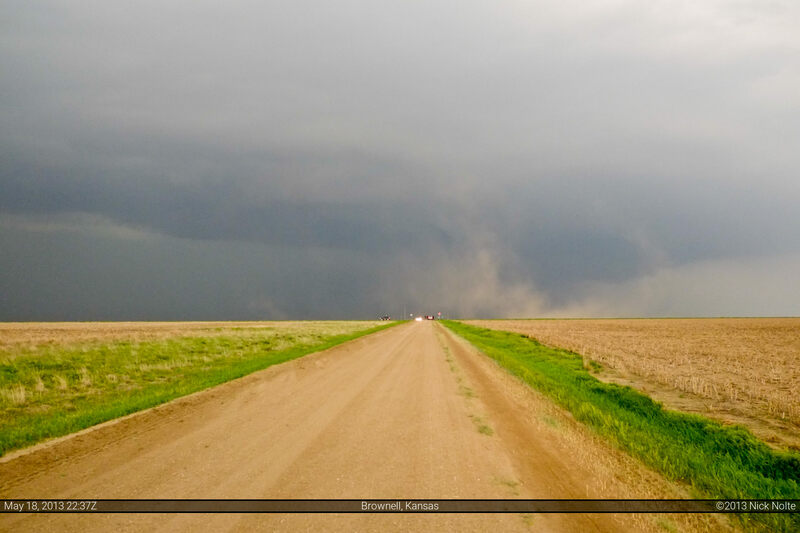 We missed the initial development and first touchdown as we drove through the forward flank of the storm. Eventually the rain lightened up enough and we got our first view of the large stovepipe shortly into its lifespan. 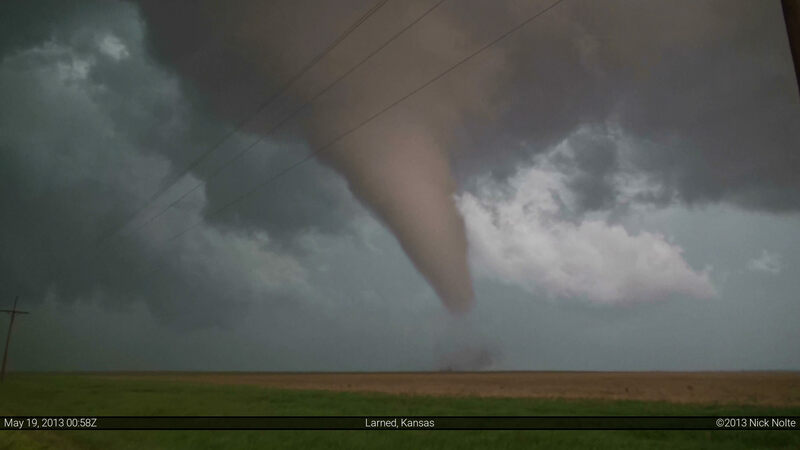 The video of this event shows what we saw as we drove through the core from the north and later as we watched two other tornadoes form around us. After watching the original tornado ropeout near Rozel I noted a new circulation showing up on storm relative velocity to our east, so we were between two areas of rotation. 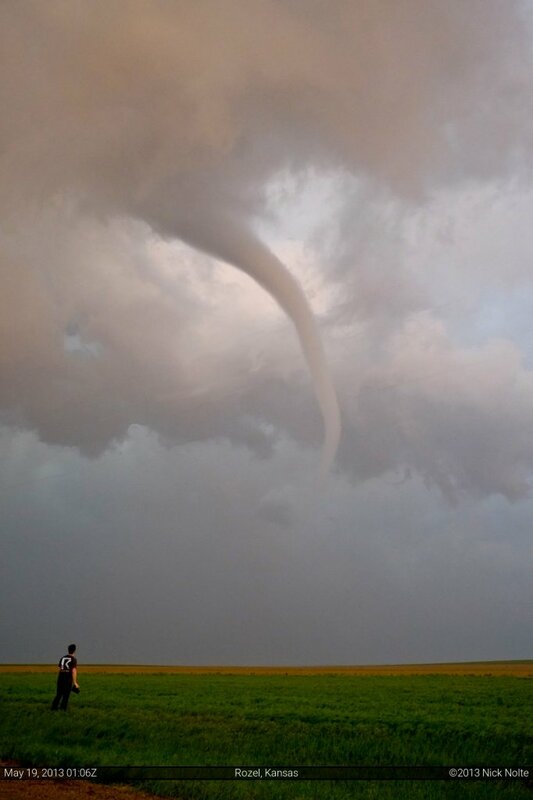 We headed east back to the highway where tornado #2 was just touching down in a field east of US 183. 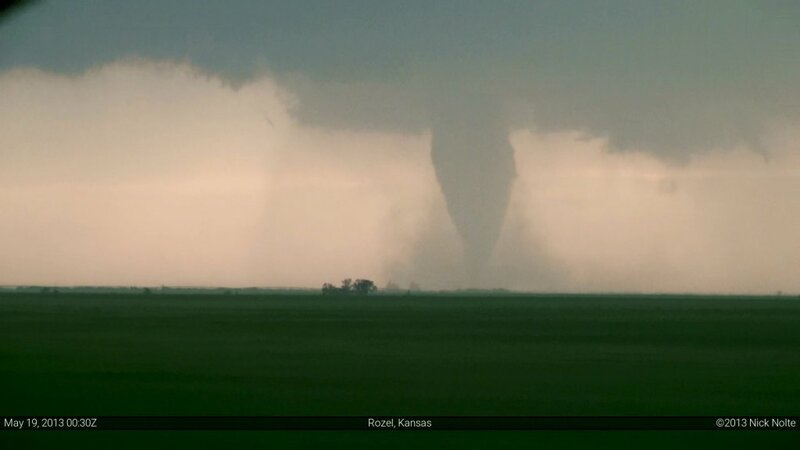 This tornado lasted about 10 minutes as it churned away in a field with slow motion allowing us to view it from a relatively close distance. 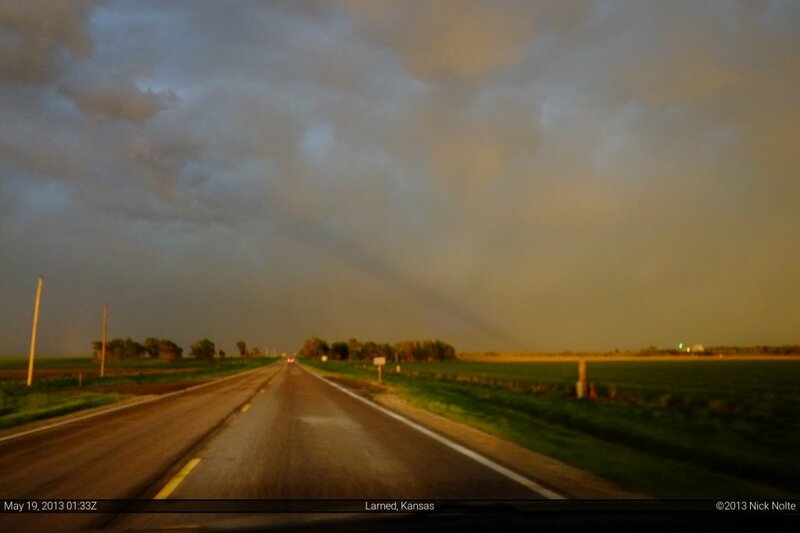 After the second tornado dissipated we headed back to the highway to go north as this storm was behind the main line at that point and we figured it was finished. 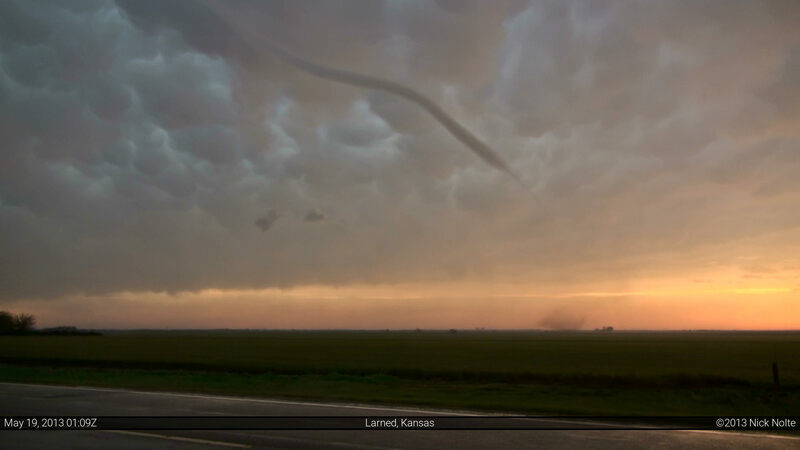 But, with one last gasp, it dropped one more rope tornado in a field on the west side of US 183 (between the original EF-4 and the second tornado above) where we were able to view it behind a palette of sunset colors and mammatus clouds! Definitely a top chase day for us as we caught three tornadoes in southwest Kansas with beautiful structure and colors. After the third tornado roped out we hit the road east to Emporia to be in position for the next day. On the way there I shot the next photo as, for the first time, I saw an anti-crepuscular ray. They form on the opposite side of the sky as the sun and appear as a dark pillars, rather than the light ones we’re more familiar with. Cool phenomenon.